Our mission is to advance the supply chain professional in the healthcare industry. 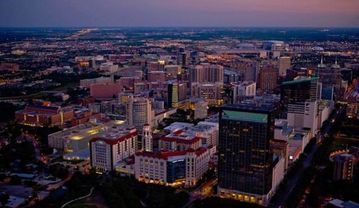 The Texas Medical Center is the largest medical center in the world with one of the highest densities of clinical facilities for patient care, basic science, and translational research. Located in Greater Houston, the center contains 50 medicine-related institutions, including 15 hospitals and two specialty institutions, two medical schools, four nursing schools, and schools of dentistry, public health, pharmacy, and other health-related practices. All 50 institutions are not-for-profit. The center exceeds one thousand acres (or 1.562 square mile) in size. Some member institutions are located outside of the city of Houston. The Center is where one of the first and largest air ambulance services was created and where one of the first successful inter-institutional transplant programs was developed. More heart surgeries are performed in Texas Medical Center than anywhere else in the world. The Texas Medical Center receives 160,000 daily visitors and over seven million annual patient visits, including over 18,000 international patients. In 2011, the center employed over 106,000 people, including 20,000 physicians, scientists, researchers and other advanced degree professionals in the life sciences.